Max - 2 degrees C.
Vasudhara Falls Falls is one of the famous tourist attractions in Uttarakhand State. It lies 9 km away from Badrinath, one of the Char Dhama - four sacred shrines located deep in the beauty of the Garhwal Himalayas. Surrounded by beautiful mountain peaks, it is a 6 km trek from Mana village, a village often linked with legendary myths of Pandavas. It’s believed that Pandavas had passed through Mana village, when they on thier journey to heaven. Encircled by lofty mountain peaks, the falls is considered as a haunting site. There is a myth behind this waterfall, that the water of Vasudhara fall diverts away from an individual who are not pure at heart. 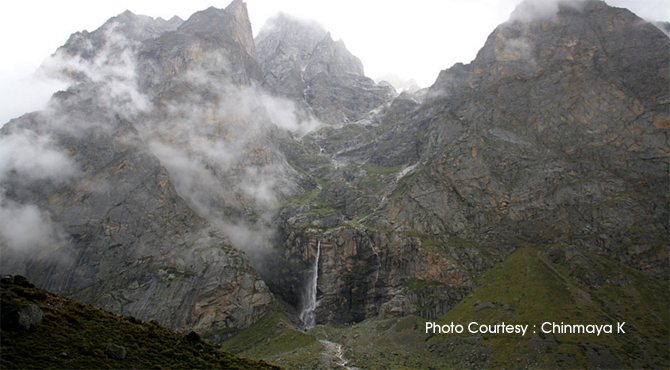 Vasudhara falls is situated at a place where glaciers and mountains peak both are in unison. Set at a height of 12,000 feet above sea level, it is 400 feet high. From a distance, the waterfall appears like streams of milk flows down from the mountain. Since, it lies in close proximity of two holy places; Rishikesh and Badrinath it visits a large number of tourists. But, the Mana village is accessible to tourists and public only when the town of Badrinath is open. It is accessible during the same time when the Badrinath is open to general public (From 2nd week of May to October or November every year) by road from Badrinath. Eventhough, it is a difficult destination to reach, the falls offers an alluring atmosphere to its visitors with its exciting charm and cool ambiance. The fall looks stunning post monsoon and also during monsoon time and lush greenery and mountains around make them look more awesome. Between months March and June are considered an ideal time for visit this waterfalls. One have to trek 5 km from mana village to reach the falls. The trekking from Mana to Vasudhara takes two hours. The trek is along a stoned path with some grass and shrubs in the sides. No special permission is needed. Mana Village is 3 km from Badrinath. The first 3 kilometers of badrinath to mana village is drivable road. The first 2–3 kilometres are comparatively easy to walk. But, after passing the Saraswati Mandir, the trek becomes difficult as walkway being very steep. The views of vasudhara river valley during this inclined trek are very scenic. A bath under the falling water is very refreshing and adventurous. One can see mountains like Chaukhamba, Nilkantha and Balakun etc. The bottom left one can see Satopanth glacier. Note : There are no food or water utilities along the route, so carry water bottle and food snacks. Wear sports shoes during as the treks along stony mountain trek. Trekking information and guides are available through tourist agencies in Rishikesh. On the way one can see Vyas Cave, Ganesh Cave and Bhim Pul. Bhim Pul on the Saraswati river in Mana Village near the Badrinath dham is a natural bridge. It is believed that this was the place from where the Pandava brothers started their 'accent to heaven' . According to legend, During Pandavas transit, Draupadi - wife of Pandavas, was unable to cross the river. So, Bhima lifted a huge rock and placed it here as a bridge across river Saraswati which today is known as the Bhim Pul. Ganesh Gufa is situated in Mana village near Badrinath.It is where the epic Mahabharta and other 'Purans' are said to have been composed by Lord Ganesh. It is believed that, in this cave, Ved Vyas is believed to have lived and dictated his famous epic Mahabharata to Lord Ganesh. A distinct feature of the temple is that, there is an idol of Ved Vyas shown writing the granth (epic book) inside this cave. It is situated a 3 kms upward climb from Vyas Gufa. Legend has that, Lord Krishna who had tactfully led to the demise of the demon Kaal Yawan here by Sage Muchukund. It is said that the footprints of Lord Krishna can still be seen in the cave. Note : Only cash is accepted in Badrinath and Mana. Even hotels do not accept cards. But, in Joshimath there are several working ATM’s.